This template is used on 4585 pages, and changes to it will be widely noticed. Please test any changes in the template's /sandbox or /testcases subpages, or in a user subpage, and consider discussing changes at the talk page before implementing them. 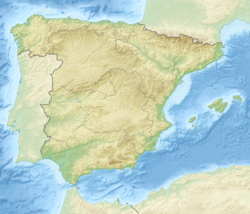 Module:Location map/data/Spain is a location map definition used to overlay markers and labels on an equirectangular projection map of Spain. The markers are placed by latitude and longitude coordinates on the default map or a similar map image. Longitude: from West to East this map definition covers 14.7 degrees. At an image width of 200 pixels, that is 0.0735 degrees per pixel. At an image width of 1000 pixels, that is 0.0147 degrees per pixel. Latitude: from North to South this map definition covers 9.7 degrees. At an image height of 200 pixels, that is 0.0485 degrees per pixel. At an image height of 1000 pixels, that is 0.0097 degrees per pixel.